Just seeing the huge changes in Palermo Viejo these days make me cringe at times . It seems that there is not a garage or old art deco house not being cashed in and being converted into a business selling all sorts of creative fashions. 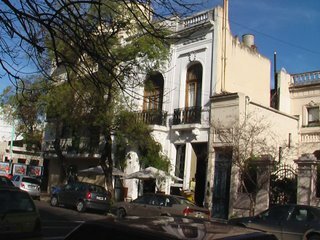 When I first saw Palermo Viejo now called Palermo SOHO five years ago I was instantly smitten with the charm and beauty of this bohemian area. In those days there were maybe 20 businesses and about 30 restaurants mainly home run with very small menus and cheap family run atmospheres. At night it was Buenos Aires hottest red light district and I remember El Salvador street and Godoy Cruz being full of silicon filled blonde hair tranvestites plying their trade very openly on every available corner. Then a few years ago the residents threw them out to the bosques of Palermo which is a famous park on the fringes of the capital.